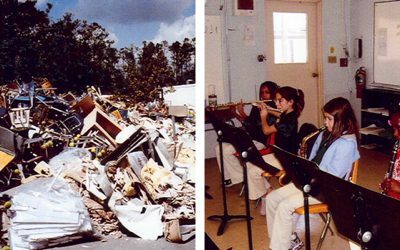 In 2005, Music Rising was launched to rescue the musical culture of the Central Gulf region of the US from the destruction caused by the catastrophic hurricanes Katrina and Rita, by replacing the musical instruments lost or destroyed in the deluge. Co-founded by U2’s the Edge and legendary producer Bob Ezrin, the organization continues to aid schools affected by natural disasters nationwide. In facing the devastation, loss, and emotional turmoil brought on by tornadoes, floods, hurricanes, fires and earthquakes, schools are not spared, and Music Rising is there in the aftermath to aid students and schools return to a normal life and routine. Restoring school music programs after this trauma is especially urgent, as playing music can bring a sense of community, healing and joy to kids who need this reassurance. The Mr. Holland’s Opus Foundation administers the fund and works with schools requesting our help, replacing instruments and supplies lost and damaged by the disaster. More than $3.3 million worth of instruments have been donated, helping to restore music programs in over 100 schools over 17 years. We are now raising funds to help schools in the path of the recent hurricanes and fires – they need you. 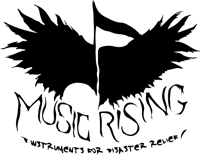 Schools in need of disaster relief assistance can email MusicRising@mhopus.org, or call 818-762-4328. Before and after - W.L. Abney Elementary, Slidell LA. New guitars for Diplomat Middle School students in Cape Coral FL. Big smiles at Raul C. Martinez Elementary School in Houston TX. Rebecca Allinson and H. William Hawkes, Jr.